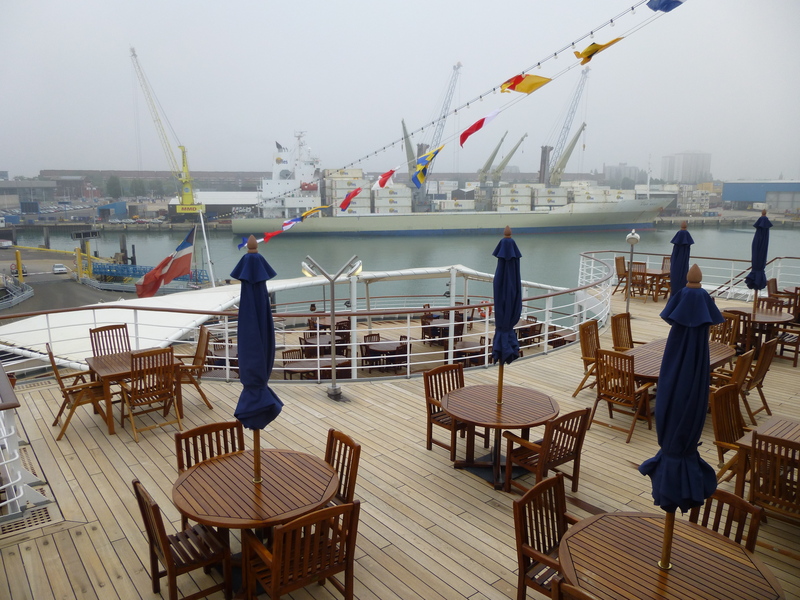 This time last week I found myself in a very grim, mist covered Portsmouth ready to embark Swan Hellenic Minerva for a tour of the ship and learn more about what Swan Hellenic has to offer. I have to say, it felt a bit strange driving past the turning for Southampton on the M3. I felt a bit out of my comfort zone but I did really well and did not employ the services of SatNav woman. All I needed to do was follow the signs for Portsmouth ferries and the new Cruise Terminal was supposedly going to make itself known to me. not in this foggy mist it didn’t. In fact, I nearly found myself driving up a ramp into a ferry, and the man donning the high vis jacket was non too impressed with my massive U-turn. Dont know what his problem was as there wasn’t another car in sight in about 10 feeder lanes for traffic. A younger version of high vis jacket man was happy to direct me to the new International Cruise Terminal just next door. good job he was there or I would never have seen it. No sign of Minerva either from what I could see. Oh wait, I think that might be here further down the dock. My last visit to a previous version of Swan Hellenic was years ago in Southampton, she was hard to find then, tucked away behind the old Martini building. Well, the new cruise terminal is nothing to write home about. Not the bit I saw anyway. There was an upstairs waiting area which I didn’t see, but downstairs there is a very small check in desk, some airport style seating and a newsagent type shop where refreshments etc could be purchased. We were called in groups to board buses and be taken the short bus trip down the dock area to the waiting ship. 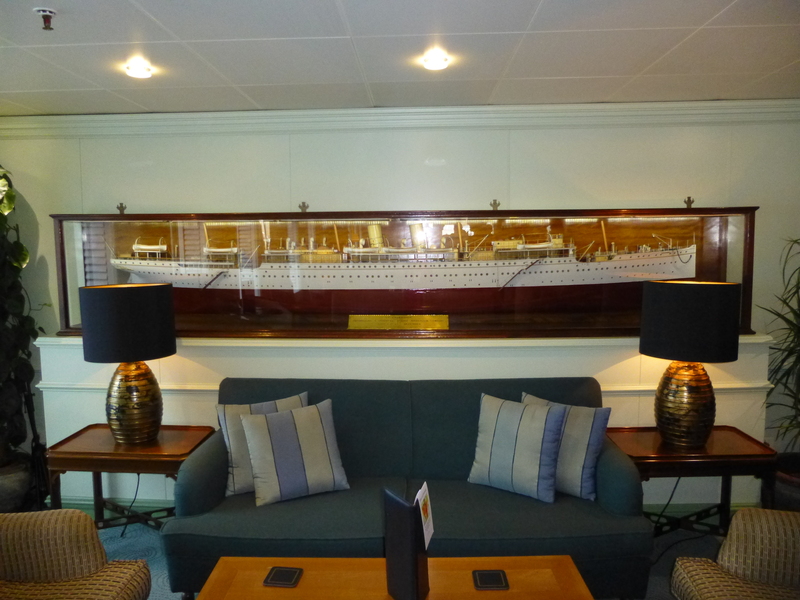 We boarded straight into the ships main foyer with Reception desk and shore excursion desk, and took a flight of stairs upto the Livingstone Lounge which is used onboard for workshops and meetings. I was greeted with a tray of Pimms, champagne, bucks fizz and orange juice and although it seemed a little early, and not quite the weather for it I decided to partake in a glass of pimms and had a nibble of the snacks on the tables. Pimms first thing in the morning is quite refreshing, I must try it again sometime. After a brief introduction to the world of Minerva we commenced or tour of the ship. The actual ship is as old as me, if not older, and has been many things in her previous lives and was once intended to be a Russian spy vessel. But Swan Hellenic wanted to maintain what they had always been able to deliver with the original Minerva and Orpheus before her. Minerva does ooze old world charm and a traditional’ness that I haven’t seen on a ship for many years. That traditionalism is actually very refreshing amongst all the galm and glitz of todays newer ships. 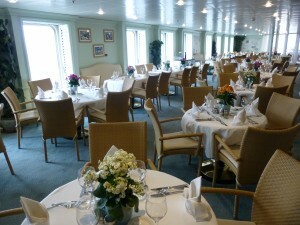 I grew up on older traditional ships, so I appreciate the decor and onboard ambience, others may not! Next to the Livingstone Lounge is a massive library. 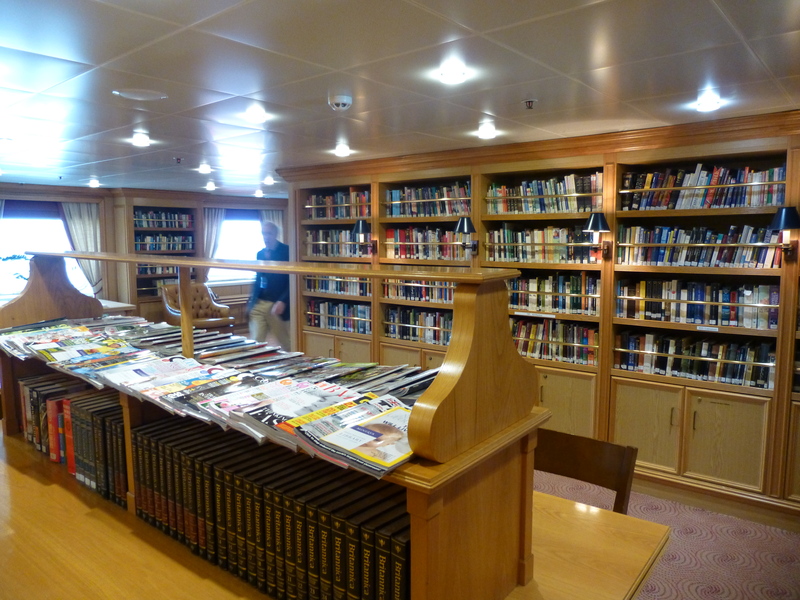 Clearly Swan Hellenic passengers like to read. 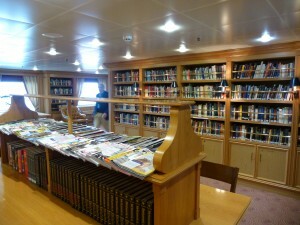 It was crammed with books, magazines and monthly publications that are all changed regularly and a chosen to match the destination of the current cruise. There is a small internet lunge with six computers and I think wifi was available in the public areas. 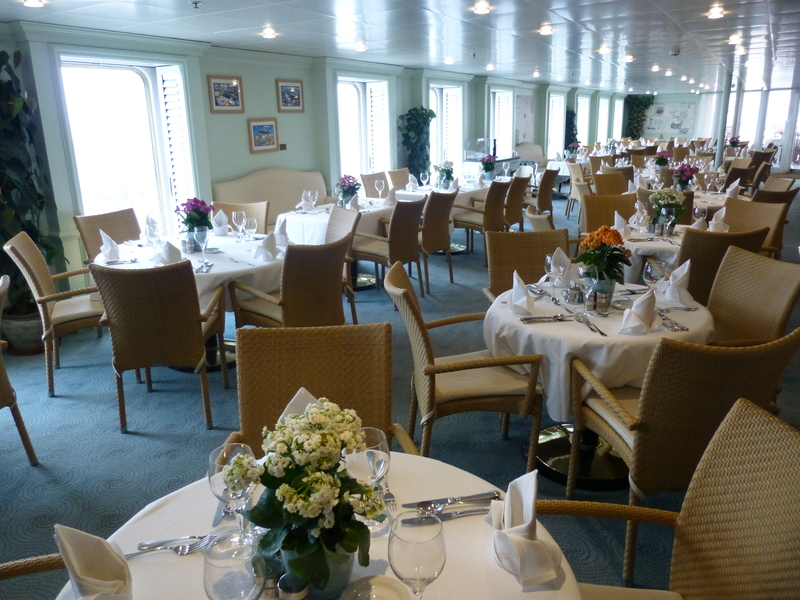 The Card Room, thats something you don’t very often see on ships these days, but many of my clients do ask about facilities for playing bridge so Swan Hellenic may be the ship for you as the large Card Room was all set up for a game of bridge. 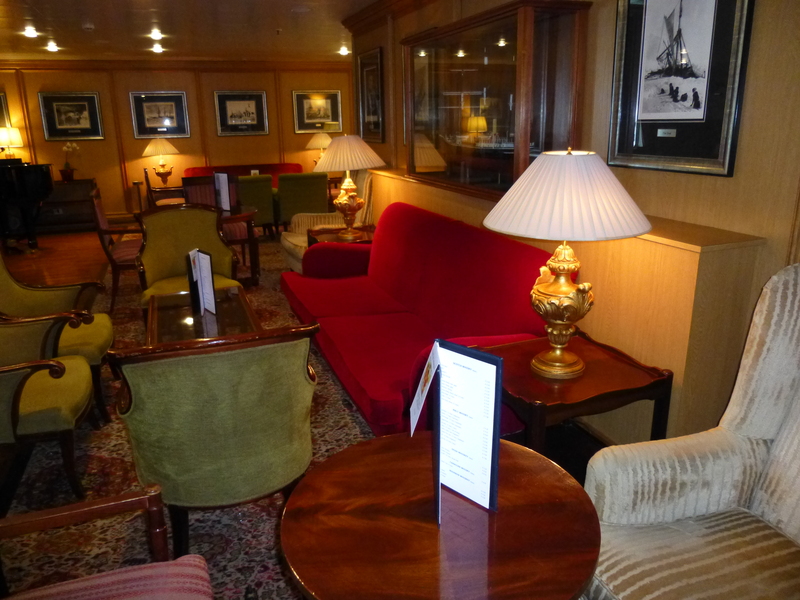 The Orpheus Lounge is a brand new addition to Minerva and was structured during her recent refit in 2012. Located forward on the top deck it used to be a gym which I could only imagine was a wasted space on a ship like this, but is now a stunningly, light and airy panoramic lounge that has many uses. Great for sitting and watching the world go by during the day, as well as classes and lectures, and in the evening it’s a cocktail lounge and dance venue. 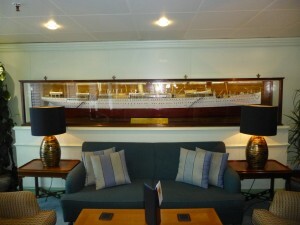 The Shackleton Bar is another feature of the recent refit and wraps around to either side of the ship. A cocktail pianist was setting the scene for us and I would have been very comfy in one of the many high backed armchairs or comfy sofa, with drink in hand, listening him to him play pre or post dinner. The Wheeler Bar had a mix of traditional and more contemporary furnishings and served tea, coffee and drinks throughout the day. 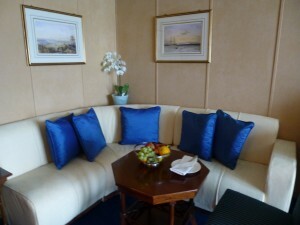 a nice place to relax and situated just off the main aft deck area would be a nice place to retreat from the open deck. A ship model of the original Swan Hellenic ship, Orpheus was displayed in a glass case at the far end of the room and I’m sure is the talking point of many a discussion. The Darwin Lounge is a large lounge with comfortable lounge type seating and is the main lounge used for lectures and talks onboard. 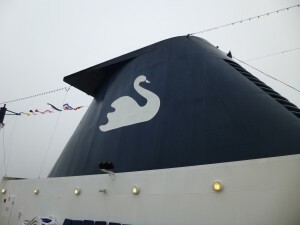 Swan Hellenic is well known for providing some excellent onboard speakers covering a wide range of topics from bird watching, wildlife, history and destinations etc. I would imagine that this venue is very popular amongst passengers as many are drawn to Swan Hellenic for the lectures and onboard speakers. During the evening the room is also used for live music, shows and films. The Veranda Restaurant is not 24 hrs but is open for breakfast, lunch and dinner and is self service. Having said that it is far from a cafeteria feel as all of the tables were laid with crisp white tablecloths, cutlery and glasses, no plastic plates and glasses in sight which is a big bug bear of mine! It looked very chic and welcoming and I would imagine that has a very cosy and nice ambience in the evening. Shops onboard did transport me back a good 40 years to the days of the old Orsova and the like. The shops were so small and quaint, if you blinked you would miss them, but the good news is I doubt they have any tat table sales on sea days as there simply isn’t room to display a table full of tat. Minerva no longer has a wrap around Promenade deck as the area was used in the refit to accommodate more balcony cabins, but the remains of the old teak deck can be clearly seen in the decking of the new balconies. Minerva does have plenty of outdoor space and on the new Promenade deck at the top of the ship there is a wide expanse of deck either side of the ship. This leads down to a tiered terrace of tables and chairs overlooking the main pool deck and aft terrace area. There is only the one pool onboard and the surrounding deck is covered by a canopy for alfresco dining from the nearby Veranda Restaurant. 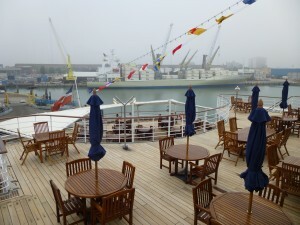 Both of these decks were laid out with traditional teak tables and chairs which were beautifully maintained and varnished. A good range of cabins are available onboard Minerva from inside and outside cabins to very nicely presented balcony cabins and owners Suites. 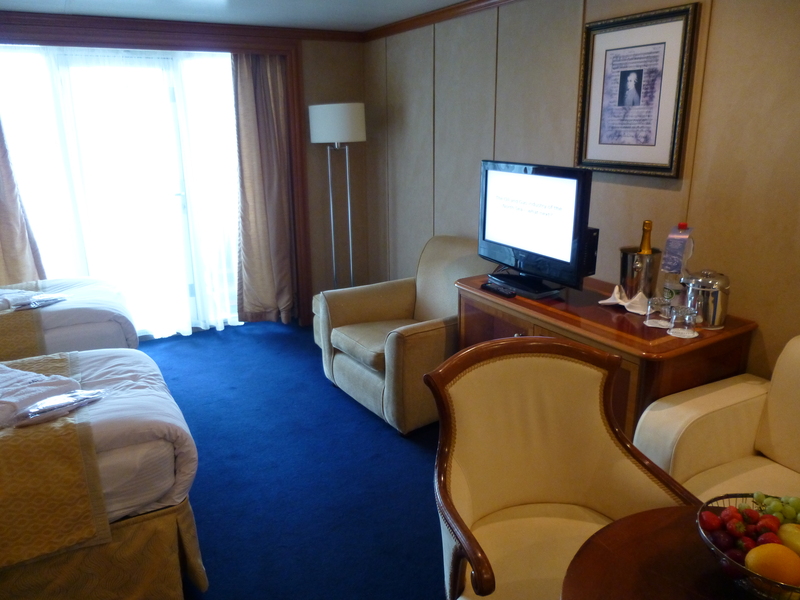 One side of the ship seems to have showers and the other has baths, so it is worth checking when booking. There are two Owners Suites and are very nicely appointed with plenty of space, lovely wood furnishings and separate seating areas, as well of course as private balcony. Deluxe and Superior Balcony cabins are very nicely furnished with plenty of storage space, dressing table, a small sofa and. There are very slight differences between Superior and Deluxe in the form of layout but offer basically the same facilities. Deluxe balcony cabins were added in the refit so are the ones with the teak decked balcony as they were part of the original Promenade deck. The Inside and outside cabins were well fitted and offered a small sofa seating area and plenty of storage. Minerva does still have a gym, but a much smaller version on the lower decks of the ship. Minerva also has what could possibly be described as the smallest Spa and Salon at sea. It was so small I couldnt get a proper photo of it. It was literally a small salon and one treatment room, but as with everywhere else on Minerva was very nicely presented and friendly welcoming staff. Time for lunch, in the Swans Restaurant, which was very richly furnished, with high backed mahogany chairs, and beautifully laid tables of wine linen cloths and silver cutlery. The service from the friendly Filipino crew was excellent and the meal was beautifully presented. I have to say that it was extremely tasty and well flavoured to. Catering for smaller numbers, instead of the mass market thousands of passengers at once, obviously makes a difference. The food was all served hot to, not warm but just about acceptable, which is another pet hate of mine. I was offered many top ups of my wine glass throughout lunch but as I had to drive I only had half a glass and then drank cola, which felt very odd and not quite right. Minerva is very much a traditional ship and offers and old world charm and tradional feel that I thought had long been forgotten in cruising, but was a refreshing change to catch a glimpse of. She is described as small ship country house charm and she oozes it. The crew all seem very happy and seem to be one big happy family, so happy crew has got to mean happy passengers on a very happy ship! 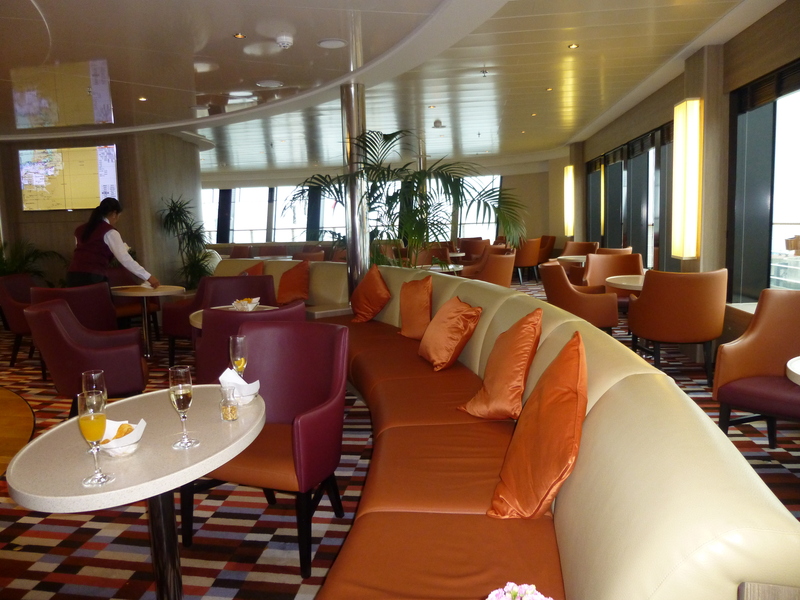 Minerva offers some very different itineraries to the main stream cruise lines, so different that many passengers stay on for repeat back to back cruises. Minerva is very much suited to those with a mind to travel. Minerva has a maximum capacity of 350 passengers so getting to know your fellow passengers should never be too much of a problem. Swan Hellenic offer a tailor made programme of shore excursions that are offered in all ports of call and are often hosted by the guest lecturers onboard. All gratuities are included onboard, and from what I saw of the drinks prices they are very reasonable. Whats more, if you live within a 75 mile radius of the port Swan Hellenic offer a complimentary chauffeur service from your home to the ship or the airport. Minerva has a range of itineraries which include Baltic, Black Sea, Adriatic, Aegean, Mediterranean, Caribbean, Central America, South America, India and the Far East.